Anodic oxidation is a powerful electrochemical technology to growt different kinds of nanomaterials with extremely high aspect ratios on several metal substrates. Depending on the metal, the electrolyte composition and on the experimental parameters (applied voltage, temperature, time, etc.) it is possible to obtain different metal-oxide nanostructures such as TiO2 nanotubes (Figure 1a), ZnO nanowires (Figure 1b) and WO3 spongelike porous layers (Figure 1c) on titanium, zinc and tungsten substrates respectively. Figure 1. FESEM images of TiO2 (a), ZnO (b) and WO3 (c) nanostructures obtained by anodic oxidation. Moreover, the growth of the nanostructures is not dependent on the shape of the metal substrate allowing to open the way to different device architectures such as wire-shaped (Figure 2a), mesh type (Figure 2b) or the additively manufactured 3D pieces (Figure 2b). Figure 2. FESEM images of TiO2 nanotubes grown by anodic oxidation on Ti wire (a), Ti mesh (b) and 3D additively manufactured Ti6Al4V pillar array (c). These nanostructured multifunctional materials can find application in several fields ranging from biomedical devices, memristors, sensors, Li-ions batteries, supercapacitors, water photoelectrolysis, dye-sensitized solar cells, and photo and electrocatalytic degradation of pollutants. Laser-induced graphene (LIG) obtained by laser writing of polymeric substrates has been recently reported as an incredibly promising material for flexible electronics. It consists of a three-dimensional network of few layer graphene obtained by a laser writing process of the polymeric surface (Figure 3). These conductive paths obtained on flexible substrate can be exploited for the fabrication of supercapacitors, batteries, photoelectrochemical solar cells, electrochemical sensors and many other devices that can take advantage from a porous high-surface-area graphene-based network on polymeric substrate. Through electrospinning technique, non-woven dried nanofiber mats are collected on the counter electrode (see Figure 1). 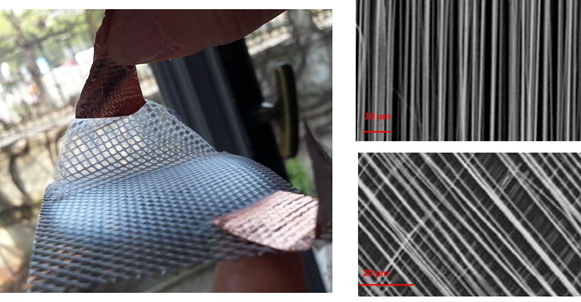 The key advantages of such technology are: i) the polymer can be arranged in a micro/macro porous structure, providing a high surface area to volume ratio; ii) the possibility to collect nanofiber mats, based on several kinds of materials, such as ceramic or carbon based materials, obtained by electrospinning and implementing successively a proper heating treatment; iii) the tuning of ordered distributions of nanofibers, obtained by modulating the electric field during the process (see Figure 2). The possibility to order the nanofibers distributions according to different geometries opens the door for the optimization of these nanofiber mats as scaffolds. In the recent years, one of the main target is focused on the development of scaffolds, able to improve the bacteria growth on carbon- based electrodes, applied as anodes in our bio-electrochemical systems, (Microbial Fuel Cells), as represented in Figure 3. 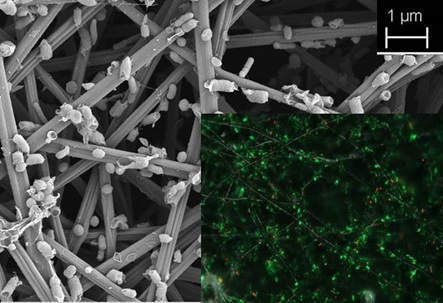 Figure 3) SEM images of a biofilm grown on nanofibers, used as scaffolds. In particular, bacteria growth on nanofibers are highlighted by fluorescence images, obtained by live/dead protocol. Aerogels are synthetic materials characterized by high porosity. They are obtained by gels in which air properly substituted the starting liquid component. Almost all materials can be turned in aerogels by the optimization of a proper synthesis route. Polymeric, ceramic and composite aerogels can be successfully obtained, so that the term aerogel actually identifies all materials characterized by a specific geometric structure. A key feature of aerogels is the high percentage of air trapped inside, from 80 to 99 % of their volume, that makes them extremely light (see Fig. 1). They usually exhibit extremely high mechanical resistance and optimal insulating behaviour. Given the set of properties shown by aerogels, they find application in several areas as proposed in Fig. 1. Fig. 1 Example of an aerogel and main application areas. Our interest in aerogels focuses on their optimization in the fields of energy, environmental science and automotive, with a particular care to the development of sustainable and green approaches to their synthesis. L. Delmondo, G.P. Salvador, J.A. Muñoz-Tabares, A. Sacco, N. Garino, M. Castellino, M. Gerosa, G. Massaglia, A. Chiodoni, M. Quaglio, Appl. Surf. Sci, 2016, 388.